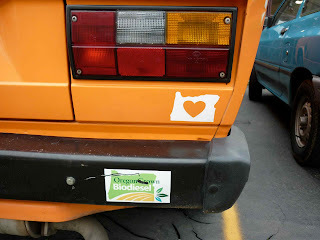 Foreign and powered by biodiesel, this fine rig fits more in to the Portland vibe than the Dodge Challenger that was previously profiled. 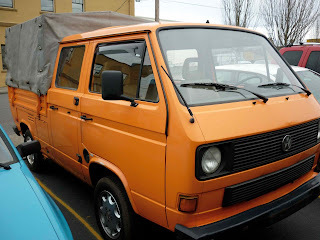 Even though the bike is king in Portland, I doubt even the staunchest cycling advocate would hate on this VW Transporter double cab. Never imported to the States by VWoA, it's likely a transplant from Canada. Painted safety orange it makes me wonder if it was a highway or construction vehicle earlier in its life. And even though these 'Dubs are rare, it's surprisingly the fourth double cab I've been able to snap a photo of over the past year and a half. Click here, here and here to see the others. 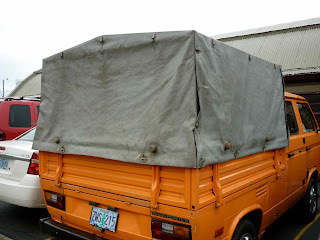 But this is the first one I've seen with a sweet fabric roll-up top. What could make this rig even better? A more-powerful turbo diesel transplant and waste veggie oil conversion. Choke the neighborhood with the sweet, sweet smell of french fries and/or Chinese food as you drive your kids to preschool (there were two kiddie seats in back).